Story: During a stormy spring morning, fierce weather was ripping the St. Mesquin-le-Retors monastery apart. Trying to stop the catastrophic weather, the monks prayed St. Mesquin-le-Retors for help, promising to return his shin bone that was in their possession to his grave if he would help them. The rain and storm died out immediately, and the monks had to find someone to take the bone to St. Mesquin-le-Retors' grave . The monks at the monastery drew straws and frère Boudin "won". Armed with nothing but the shinbone, Boudin went out on the journey. During the journey he discovered that the bone was magical. From his place on a cloud in Heaven, St. Mesquin-le-Retors could use the bone to help Boudin and others by changing the bone's shape and size, and it could also be used as a loudspeaker and phone with which he could communicate with Boudin [1,2]. Frère Boudin was last seen when he was crossing Sahara along with a platoon from the Foreign Legion . Skills & abilities: Frère Boudin is a highly skilled chef, specialized in making mushroom omelets. Equipment: Frère Boudin carries a bone of the St. Mesquin-le-Retors. The saint communicates with Frère Boudin from Heaven and animates the bone making it change shape and size to help Boudin on his quest. 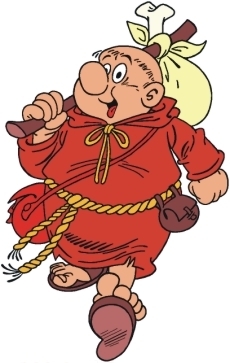 Background notes: Frère Boudin (Brother Boudin; boudin is a Belgian blood sausage) is one of those slightly silly European series poking fun at Christianity and the middle age. The series is mostly forgotten today and probably most noteworthy in Greg being the author. The series started in the Belgian series Achille Talon Magazine which was a bi-monthly magazine that only lasted 6 issues. Achille Talon Magazine was essentially the same as the magazine Pilote, only in a smaller format. The two first stories were collected along with what appears to the third and fourth story in the album Le Tibia Sacre from 1977. The second album L'os a voile from 1978 continued the story of the quest. The first part of the album has the distinct feel of being a fifth part after which the story takes the shape of a standard album story. The story ended in the middle of the quest and wasn't finished. Apparently a third album called L'os rosse des sables was planned, but for some reason it never happened.